Fantasy Football Wide Receiver Start/Sit Rankings (Week 12) - Fantasy Football, Fantasy Football Rankings | Mac Bros.
1. 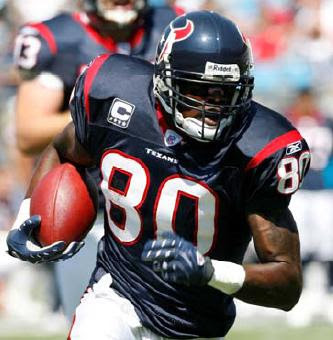 Andre Johnson (HOU) – Based solely on the fact that Johnson was able to rack up 10 catches for 103 yards against the Colts in Indianapolis just 3 weeks ago, you have to love his chances for a big performance this time around at home. 2. Randy Moss (NE) – He can be hit or miss in terms of reception and yardage totals, but you won’t find a better fantasy receiver with regard to TD potential. His week 12 match up against the Saints has some drawbacks, but this game should turn into a shootout through the air and Moss always seems come out smelling like roses in these types of games. 4. Larry Fitzgerald (ARI) – He has been playing at a top flight level over the last 3 weeks and while the Titans secondary has shown obvious improvement in their own right of late, they should prove to be no match for the elite Fitzgerald. 6. Sidney Rice (MIN) – He has entrenched himself amongst the fantasy elite this season with one monster performance after another and we love his chances to solidify that status in week 12 against a suspect Chicago secondary. Only 8 teams in the NFL have allowed more fantasy production to opposing WRs than the Bears. 7. Wes Welker (NE) – He is a virtual lock for solid fantasy production each and every week. Expect nothing less in week 12 against the Saints. 8. Anquan Boldin (ARI) – While injuries and playing in the shadow of Larry Fitzgerald have tarnished Boldin’s reputation as a stud fantasy option, we still believe that he is as capable as any WR in the NFL when healthy. The good news is that he is healthy and his numbers over the last couple of weeks show it. Ride the hot hand into a favorable week 12 match against Tennessee. 9. Chad Ochocinco (CIN) – Conditions are very favorable for Ochocinco to break out of his recent funk with a promising week 12 match up against a very poor Browns pass defense. Cleveland did limit Ocho to just 3 receptions for 24 yards in a week 4 meeting, but 2 of those receptions went for TDs. 10. Greg Jennings (GB) – We had high hopes for Jennings on Turkey Day, especially after his big week 11 performance. Unfortunately, it wasn’t meant to be as Donald Driver stole his thunder once again. Jennings just managed a pedestrian like 53 yards on 4 receptions against a terrible Lions secondary. He looks to be a very hit or miss fantasy option moving forward.